Jake Marionette is your average teenage boy. Except for the fact that he is a New York Times Bestselling author. Not many people can say they made that list before they graduated high school, yet Jake is doing it. . If you aren’t impressed yet, just hear what he has to say. We got the opportunity to talk with Jake about his book series “Just Jake” which currently has three books in it, upcoming work, and how he where he gets his motivation from. KRISTIN: Let’s start at the beginning. Can you tell us how you got into writing in the first place? JAKE: I’ll be completely honest – my mom made me in the beginning. I resisted, BUT, over time, I grew to love the freedom and creativity I find in writing. I wrote Just Jake because there wasn’t a lot of middle grade fiction, specifically for boys. When I finished the manuscript, I thought it was pretty good and so did my friends. So I thought “Why not? !” try to get it published. 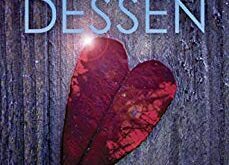 KRISTIN: At what point in your journey did you find out you had a publisher interested in your book? 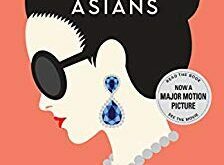 JAKE: When my agent Dan Lazar from Writer’s House organized a trip to New York City and I sat down with a handful of publishers. I knew that day there was a lot of interest so after that, it came down to finding the right partner. KRISTIN: What was the feeling you got when you heard your book(s) made the New York Times Bestsellers list? JAKE: An incredible feeling! Especially since I’m a BIG fan of the NYT’s and have admired so many authors/books that have been on the list before me. Truly, a dream come true. KRISTIN: You write about a boy very similar to you with situations you have faced in your own life, but maybe exaggerated a bit. How do you decide how much of your life you should actually use and how much you should make up? JAKE: I write fiction, but, it’s great to have my life as a blueprint onto which I can add crazy, funny, and outrageous situations. It also helps that I’ve moved around a TON so I’ve experience multiple school settings, personalities, neighborhoods, towns, etc. In reality, my life isn’t that crazy. Fortunately, I have a good imagination so I try to make the books as enjoyable as possible for the reader. KRISTIN: Do you have ideas for other series or you going to stick to writing the Just Jake series for right now? JAKE: I’d like to do both. As a matter of fact, I just started the outline on Just Jake #4 and I’ve ready completely the first book in a new series focusing on the Quinlan Quads from Just Jake #3 Camp Wild Survival. KRISTIN: What do you currently having coming up next? 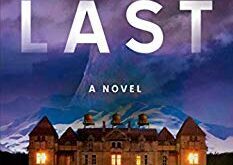 Another book in the works? JAKE: Working on the two new books I mentioned along with traveling across the country doing my motivational speaking tour and author visits. I LOVE visiting schools and talking to the kids about writing, why it’s important, how I got published and how each kid can find his/her own passion. There’s nothing like inspiring other young authors and getting kids to understand they are never too young to achieve greatness. KRISTIN: Where can we keep up with you online? Do you have twitter or facebook? KRISTIN: Thank you for taking time to talk with us. I look forward to talking with you again. JAKE: Are you kidding me?! Thank you!!!! Stay AWESOME! 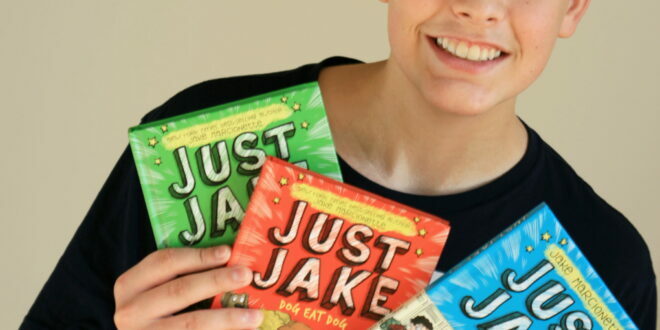 We encourage you to pick up your copies of the Just Jake series. Here is a link to Just Jake 1 now on Amazon, Barnes and Nobles, or a book store near you. From there… keep reading. 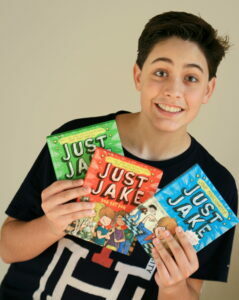 Also stay tuned for my review of the Just Jake series, coming very soon. You can also look at the Just Jake website HERE. Also make sure you leave your feedback after reading on Goodreads!